The Chinese Lunar Exploration Program (CLEP; Chinese: 中国探月; pinyin: Zhōngguó Tànyuè), also known as the Chang'e Project (Chinese: 嫦娥工程; pinyin: Cháng'é Gōngchéng) after the Chinese moon goddess Chang'e, is an ongoing series of robotic Moon missions by the China National Space Administration (CNSA). The program incorporates lunar orbiters, landers, rovers and sample return spacecraft, launched using Long March rockets. Launches and flights are monitored by a Telemetry, Tracking, and Command (TT&C) system, which uses 50-metre (160-foot) radio antennas in Beijing and 40-metre (130-foot) antennas in Kunming, Shanghai, and Ürümqi to form a 3,000-kilometre (1,900-mile) VLBI antenna. A proprietary ground application system is responsible for downlink data reception. Program insignia: a lunar crescent with two footprints at its center. The symbol resembles 月 [zh], the Chinese character for "Month", shorthand for "Moon" (月球). Ouyang Ziyuan, a geologist and chemical cosmologist, was among the first to advocate the exploitation not only of known lunar reserves of metals such as titanium, but also of helium-3, an ideal fuel for future nuclear fusion power plants. He currently serves as the chief scientist of the Chinese Lunar Exploration Program. Another scientist, Sun Jiadong, was assigned as the general designer, while scientist Sun Zezhou was assigned as the deputy general designer. The leading program manager is Luan Enjie. The first spacecraft of the program, the Chang'e 1 lunar orbiter, was launched from Xichang Satellite Launch Center on 24 October 2007, having been delayed from the initial planned date of 17–19 April 2007. A second orbiter, Chang'e 2, was launched on 1 October 2010. Chang'e 3, which includes a lander and rover, was launched on 1 December 2013 and successfully soft-landed on the Moon on 14 December 2013. Chang'e 4, which includes a lander and rover, was launched on 7 December 2018. A sample return mission, Chang'e 5, is scheduled for December 2019. 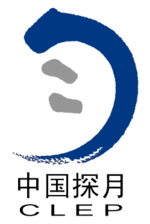 As indicated by the official insignia, the shape of a calligraphic nascent lunar crescent with two human footprints at its center reminiscent of the Chinese character 月, the Chinese character for "Month" which is shorthand for "Moon" (月球), the ultimate objective of the program is to pave the way for a manned mission to the Moon. Such a mission may occur in 2025–2030. The Chinese Lunar Exploration Program is divided into four main operational phases, with each mission serving as a technology demonstrator in preparation for future missions. International cooperation in the form of various payloads and a robotic station is invited by China. The Chang'e 5-T1 test vehicle service module took this photo of Earth and the Moon together on November 9, 2014, the service module carrying the camera in 540,000 km from Earth, at a distance of 920,000 kilometers moon shot clear of the Earth-Moon photo images. a week after successfully returning the sample capsule. The Moon's surface is quite dark compared to Earth's bright clouds. The first phase entailed the launch of two lunar orbiters, and is now effectively complete. Chang'e 1, launched on 24 October 2007 aboard a Long March 3A rocket, scanned the entire Moon in unprecedented detail, generating a high definition 3D map that would provide a reference for future soft landings. The probe also mapped the abundance and distribution of various chemical elements on the lunar surface as part of an evaluation of potentially useful resources. Chang'e 2, launched on 1 October 2010 aboard a Long March 3C rocket, reached the Moon in under 5 days, compared to 12 days for Chang'e 1, and mapped the Moon in even greater detail. It then left lunar orbit and headed for the Earth–Sun L2 Lagrangian point in order to test the TT&C network. Having done that it completed a flyby of asteroid 4179 Toutatis on 13 December 2012, before heading into deep space to further test the TT&C network. The second phase is ongoing, and incorporates spacecraft capable of soft-landing on the Moon and deploying lunar rovers. Chang'e 3, launched on 2 December 2013 aboard a Long March 3B rocket, landed on the Moon on 14 December 2013. It carried with it a 140 kg (310 lb) lunar rover named Yutu, which was designed to explore an area of 3 square kilometres (1.2 sq mi) during a 3-month mission. It was also supposed to conduct ultra-violet observations of galaxies, active galactic nuclei, variable stars, binaries, novae, quasars, and blazars, as well as the structure and dynamics of the Earth's plasmasphere. Chang'e 4 was launched on 7 December 2018. Originally scheduled for 2015, was a back-up for Chang'e 3. However, as a result of the success of that mission, the configuration of Chang'e 4 was adjusted for the next mission. It landed on 3 January 2019 on the South Pole-Aitken Basin, on the far side of the Moon, and deployed the Yutu-2 rover. The third phase will entail a lunar sample-return mission. Chang'e 5-T1 was launched on 23 October 2014. It was designed to test the lunar return spacecraft. Chang'e 5, expected to launch in December 2019 aboard a Long March 5 rocket, will build on the success of the previous missions, with a lander capable of collecting up to 2 kilograms (4.4 lb) of lunar samples and returning them to the Earth. Development of a robotic research station near the Moon's south pole. Chang'e 6, expected to launch in 2023 or 2024, will investigate the topography, composition and subsurface structure of the landing site, and it will return south polar samples to Earth. Chang'e 7, expected to launch in 2023, is a lander that will explore the south pole for resources. The mission may include an orbiter, a lander and a rover. Chang'e 8, expected to launch in 2027, will verify the utilization and development of natural resources. It may include a lander, a rover, and a flying detector, as well as a 3D-printing experiment using in-situ resource utilization (ISRU) to build a structure. It will also transport a small sealed ecosystem experiment. As of 2019[update], China was reviewing preliminary studies for a crewed lunar landing mission in the 2030s, and possibly build an outpost near the lunar south pole with international cooperation. The biggest challenge in Phase I of the program was the operation of the TT&C system, because its transmission capability needed sufficient range to communicate with the probes in lunar orbit. China's standard satellite telemetry had a range of 80,000 km (50,000 mi), but the distance between the Moon and the Earth can exceed 400,000 km (250,000 mi) when the Moon is at apogee. In addition, the Chang'e probes had to carry out many attitude maneuvers during their flights to the Moon and during operations in lunar orbit. The distance across China from east to west is 5,000 km (3,100 mi), forming another challenge to TT&C continuity. At present, the combination of the TT&C system and the Chinese astronomical observation network has met the needs of the Chang'e program, but only by a small margin. The complexity of the space environment encountered during the Chang'e missions imposed strict requirements for environmental adaptability and reliability of the probes and their instruments. The high-radiation environment in Earth-Moon space required hardened electronics to prevent electromagnetic damage to spacecraft instruments. The extreme temperature range, from 130 °C (266 °F) on the side of the spacecraft facing the Sun to −170 °C (−274 °F) on the side facing away from the Sun, imposed strict requirements for temperature control in the design of the detectors. Given the conditions of the three-body system of the Earth, Moon and a space probe, the orbit design of lunar orbiters is more complicated than that of Earth-orbiting satellites, which only deal with a two-body system. The Chang'e 1 and Chang'e 2 probes were first sent into highly elliptical Earth orbits. After separating from their launch vehicles, they entered an Earth-Moon transfer orbit through three accelerations in the phase-modulated orbit. These accelerations were conducted 16, 24, and 48 hours into the missions, during which several orbit adjustments and attitude maneuvers were carried out so as to ensure the probes' capture by lunar gravity. After operating in the Earth-Moon orbit for 4–5 days, each probe entered a lunar acquisition orbit. After entering their target orbits, conducting three braking maneuvers and experiencing three different orbit phases, Chang'e 1 and Chang'e 2 carried out their missions. Lunar orbiters have to remain properly oriented with respect to the Earth, Moon and Sun. All onboard detectors must be kept facing the lunar surface in order to complete their scientific missions, communication antennas have to face the Earth in order to receive commands and transfer scientific data, and solar panels must be oriented toward the Sun in order to acquire power. During lunar orbit, the Earth, the Moon and the Sun also move, so attitude control is a complex three-vector control process. The Chang'e satellites need to adjust their attitude very carefully to maintain an optimal angle towards all three bodies. During the second phase of the program, in which the spacecraft were required to soft-land on the lunar surface, it was necessary to devise a system of automatic hazard avoidance in order that the landers would not attempt to touch down on unsuitable terrain. Chang'e 3 utilized a computer vision system in which the data from a down-facing camera, as well as 2 ranging devices, were processed using specialized software. The software controlled the final stages of descent, adjusting the attitude of the spacecraft and the throttle of its main engine. The spacecraft hovered first at 100 metres (330 ft), then at 30 metres (98 ft), as it searched for a suitable spot to set down. The Yutu rover is also equipped with front-facing stereo cameras and hazard avoidance technology. In November 2017, China and Russia signed an agreement on cooperative lunar and deep space exploration. The agreement includes six sectors, covering lunar and deep space, joint spacecraft development, space electronics, Earth remote sensing data, and space debris monitoring. Russia may also look to develop closer ties with China in human spaceflight, and even shift its human spaceflight cooperation from the US to China and build a crewed lunar lander. ^ ""嫦娥一号"发射时间确定 但未到公布时机". Xinhua News Agency. 2007-07-07. Archived from the original on March 15, 2012. Retrieved July 12, 2007. ^ "China's 2nd lunar probe Chang'e-2 blasts off". Xinhua. 1 October 2010. Retrieved 1 October 2010. ^ Nowakowski, Tomasz (9 August 2017). "Chine Eyes Manned Lunar Landing by 2036". Retrieved 17 August 2017. ^ "China considering manned lunar landing in 2025–2030". ^ a b c d Chang'e 4 press conference. CNSA, broadcast on 14 January 2019. ^ "China Celebrates Lunar Probe and Announces Return Plans". The New York Times. 2013-12-16. Retrieved 16 December 2013. ^ Rivers, Matt; Regan, Helen; Jiang, Steven (3 January 2019). "China lunar rover successfully touches down on far side of the moon, state media announces". CNN. Retrieved 3 January 2019. ^ "China plans to launch Chang'e 5 in 2017". Archived from the original on 2013-12-30. ^ A Tentative Plan of China to Establish a Lunar Research Station in the Next Ten Years. Zou, Yongliao; Xu, Lin; Jia, Yingzhuo. 42nd COSPAR Scientific Assembly. Held 14–22 July 2018, in Pasadena, California, USA, Abstract id. B3.1-34-18. ^ Chang’e-4 landing to be a step along a road of lunar exploration for China. Andrew Jones, Space News. December 28, 2018. ^ a b China lays out its ambitions to colonize the moon and build a "lunar palace". Echo Huang, Quartz. 26 April 2018. ^ China is making preparations for manned lunar landing. Global Times, Source: Xinhua. 7 June 2017. ^ China prepares first manned mission to the Moon. Ben Blanchard, Independent. 7 June 2017. ^ "Proceedings of the 26th Conference of Spacecraft TT&C Technology in China". ^ "China's Location, Size, Land Boundaries, Length of Coastline, and Maritime Claims". ^ "China Builds Advanced Spacecraft Tracking and Command Network". ^ a b c China, Russia agree cooperation on lunar and deep space exploration, other sectors. GB Times. 2 November 2017. ^ Russia, China to add lunar projects to joint space cooperation program. TASS, Russia. 11 July 2018. ^ China, Russia agree cooperation on lunar and deep space. Janet R. Aguilar, Tunisie Soir. 3 March 2018. ^ Russia's Space Agency Might Break Up With the U.S. To Get With China. Anatoly Zak, Popular Mechanics. 7 March 2018. Wikimedia Commons has media related to Chinese Lunar Exploration Program.